Viburnum nudum.© 2002 Janet Novak.www.ct-botanical-society.org. (Accessed 6/2014). Viburnum nudum is a shrub to 4 m tall, young stems often slightly brown scaly new growth red-brown, older twigs gray; terminal buds oblong, about 1.5 cm long, leaf buds 0.3-0.6 cm long, flattened, 2-scaled, tip blunt, reddish-brown to grayish brown, grainy-scaly, flower buds about 1 cm long at twig tips; leaf scar horizontally “v” shaped with three bundle scars, narrow, ridge across stem pointed upward. Leaves opposite, stalk to 1.5 cm long, often narrowly winged, blade to 6-15 cm long, 3-7 cm wide, lance-shaped to widest above middle, usually pointed at both ends, surface leathery, shiny, veins conspicuous below, curving, branching and rejoining before reaching thickened, slightly wavy margin. Flowers white, regular, small, 5-parted, in a dome-shaped, branched cluster 6-12 cm wide (Rehder, 1986), on a stalk to 2-5 cm long; blooms May-June. 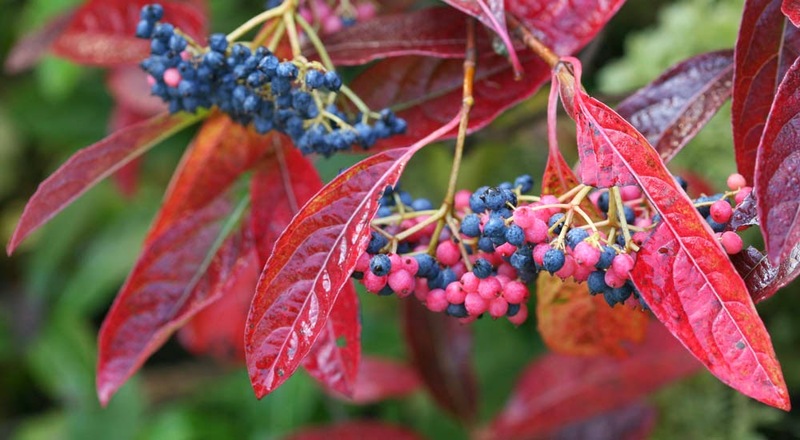 Viburnum nudum.Brandywine (TM) Viburnum nudum “Bulk” | Viburnum.com A Complete Database (Accessed 4/2017). Fruit fleshy, becoming black, about 0.8 cm,seed round to egg-shaped; July-Oct. Frequency in NYC: Rare (NYS S1, T ). 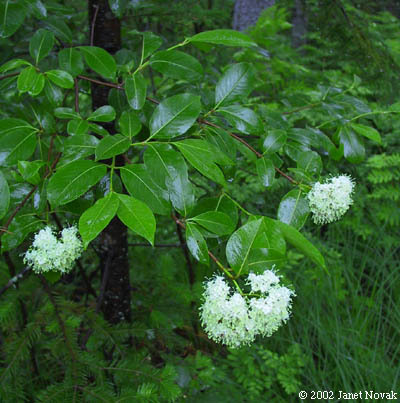 Habitat: Swamp forests, somewhat shade tolerant but does not bloom in deep shade.